A low-level laser that eradicates toenail fungus in just a few short treatments without heat, pain or any adverse effects? 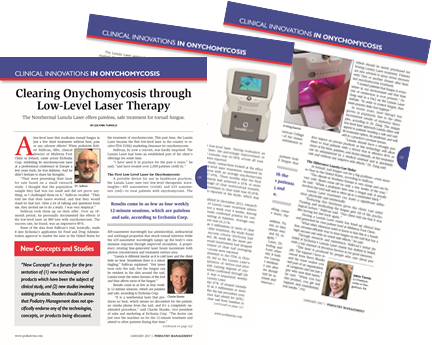 When podiatrist Robert Sullivan, MSc, clinical director of Midleton Foot Clinic in Ireland, came across Erchonia Corp. exhibiting its onychomycosis laser at a professional conference in Europe a few years back, he was dubious. And he didn’t hesitate to share his thoughts. “They were presenting their laser for sale based on a small research study. I thought that the population sample they had was too small and did not prove anything, so I challenged them on it,” Sullivan recalled. “They told me that their lasers worked, and that they would stand by that fact. After a lot of talking and questions from me, they invited me to do a study. I was very skeptical.” Sullivan took them up on their offer. Over an 18- month period, he personally documented the effects of the low-level laser on 800 toes with onychomycosis. The success rate, he found, was an impressive 89%. Click Here to read the full article.